Subscribe to our Newsletter, so you'll hear all our news first! 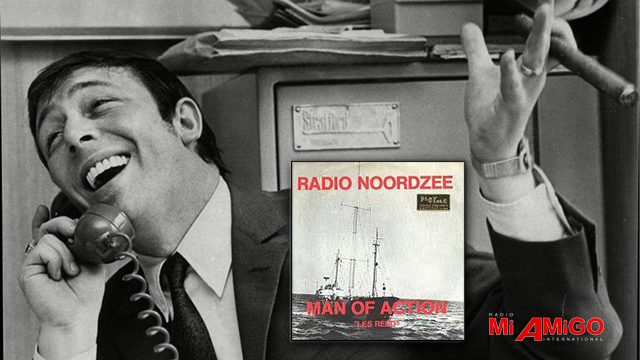 Offshore Radio fans will always remember Les Reed's famous RNI tune: 'Man Of Action', that was played on the station during its entire existence. But there was so much more: Les was well known for co-writing Tom Jones hits 'Delilah' and 'It's Not Unusual', as well as Engelbert Humperdinck's 'The Last Waltz' and hundreds of other songs. Our daily presented program 'Hello Europe', last Wednesday broadcasted an improvised a 'Les Reed special tribute', with many known and lesser known songs from the oeuvre of this brilliant British conductor- orchestral leader and composer, who gave us so much joy through all his great music, especially during 'the Golden Era of Offshore Radio'. Saturday, 12:00 hrs and on Sunday 14:00 hrs, Central European Time. Hello to the -changed- World..! 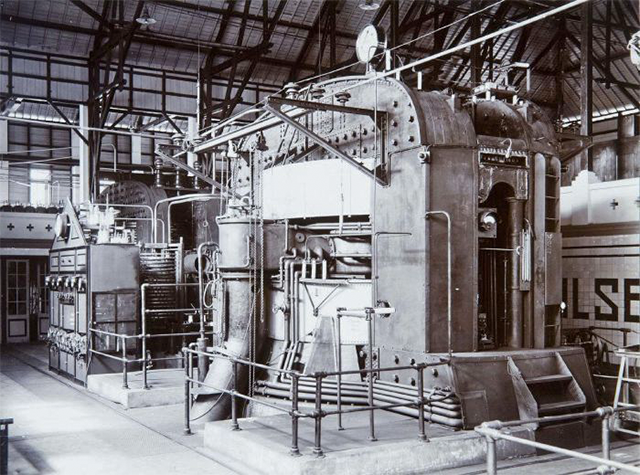 With this 2400 kilowatt Poulsen arc transmitter, the largest one ever built, in May 1923, the first 12.000km radio link was established between the Dutch East-Indies and the Kootwijk radio communication station in the Netherlands. An entire village and a huge complex was built to house the transmitters, transformers and power generators. An antenna array with a length of more than 2 miles was stretched through a mountain valley. What a contrast... 96 years later, once again sending radio programs from the now Indonesian island of Bali to the Netherlands, Europe and to our shortwave transmitters in Germany. This time only using a simple laptop and a fiber-optic internet connection. How symbolic for times -and a world- that have changed beyond imagination. Never before was the title of our program 'Hello To The World' this applicable, as of this weekend, for the next 2 months' it is coming to you "live, from under the volcano, in the heart of Indonesia's' Ring Of Fire', from our studio on the tropical island of Bali..!" 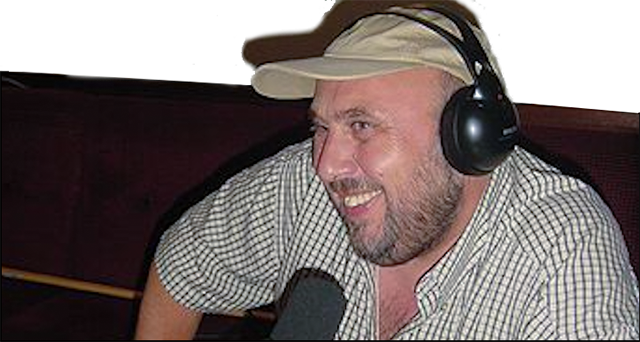 Another former offshore radio jock is joining our ranks: Steve Foster (UK), formerly of Abie Nathan's 'The Voice of Peace'. 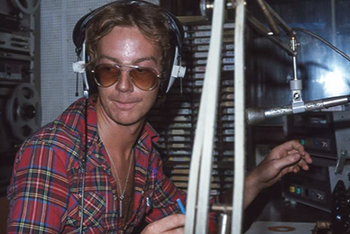 During the late 70’s, Steve presented shows such as 'the International Top 40', 'Breakfast' and 'Twilight Time', on 'The Voice Of Peace', the international offshore radio station based onboard the 'MV Peace', anchored in international waters off the coast of Tel Aviv in Israel. The ship’s powerful 50,000 watt signal covered a big part of the Middle East, Cyprus and Greece. Station supporters included John and Yoko Lennon and Abba. 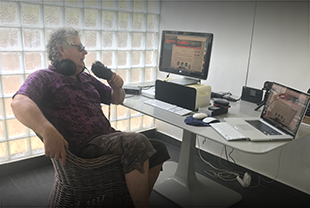 The station was founded and operated by the Israeli peace activist Abbie Nathan. Our highly successful yearly winter competition has now closed and this week we're happy to announce the winners. Thanks everyone for sending your entries and complete all these pieces of the puzzle. Visit the competition page to see who won our winter competition! 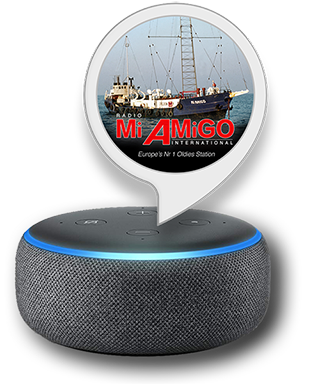 If you own an Alexa device, such as this 'Echo Dot', you can now command it to play Radio Mi Amigo International, it will understand and know what to do. Alexa devices -made by Amazon- are only fully functional and available in the US and the UK and only 'understand' the English language. Its Radio Mi Amigo International skill however, will work anywhere when you operate an Alexa device in other countries. 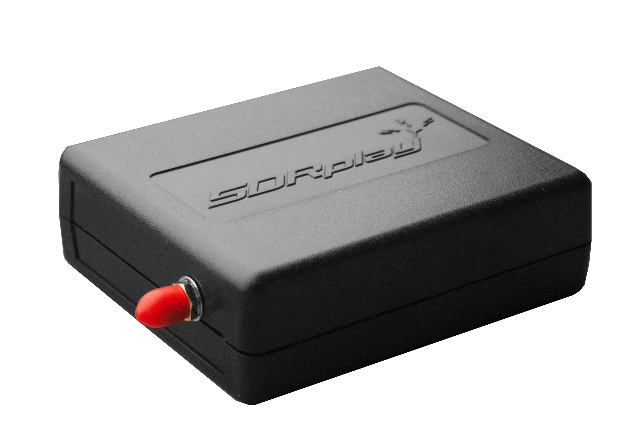 This weekend, once again we welcome Jon Hudson, founder of SDRplay, that magic black box that brings the world of radio to your PC, giving you a whole new experience discovering what's going on in the AM radio bands - yes, ALL of them! ...they all use Shortwave radio communication, and YOU can listen to them! And there's a lot more you can do with it as Jon Hudson explains talking Bob James in this weekend's edition of 'The Radio Cave'. Tune in to get all the details firsthand. 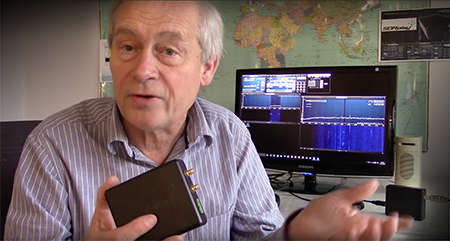 As your old Shortwave radio may not cover all bands, it's time to try Software Defined Radio, or SDR - by SDRplay: the latest way to access the entire radio spectrum from Longwave to Microwaves - and everything in between. Once connected to your PC, it offers a fully integrated design and a really user-friendly display, you'll be amazed by what this -super sensitive, low noise- little black box can do and discover it is the only radio receiver you'll ever need..! Bruno Hantson's new French show, starting this weekend! THE BIG WINTER COMPETITION IS HERE! Our big annual winter competition kicks off this weekend! See our competition page to find out what great prizes you can win and how easy it is to participate! 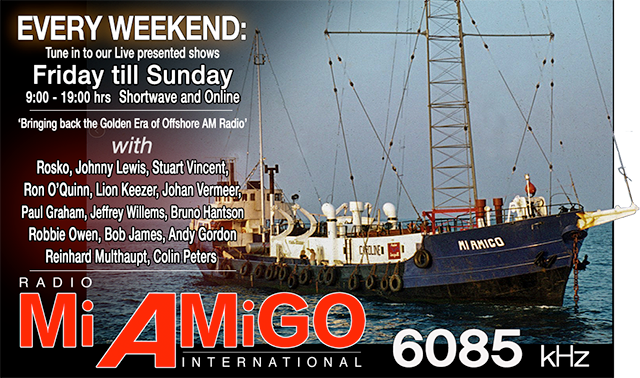 Then... just listen and answer the weekly questions we give in all our presented weekend shows, can't miss! YOU can be a WINNER this winter! 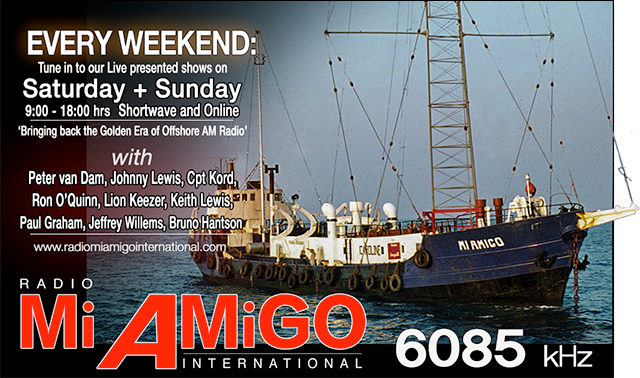 Just in: THIS WEEKEND: 2 new offshore radio jocks to join Radio Mi Amigo Int.! WELCOME BOB LE-ROI and HANS HOGENDOORN! This weekend will see the première of two new shows on Radio Mi Amigo International: Former RNI Dutch newsreader and DJ Hans 'ten Hooge' Hogendoorn's first show will air on Saturday and Sunday while Bob Le-Roi (UK) will also be heard for the first time on our station, starting this Friday and Sunday. 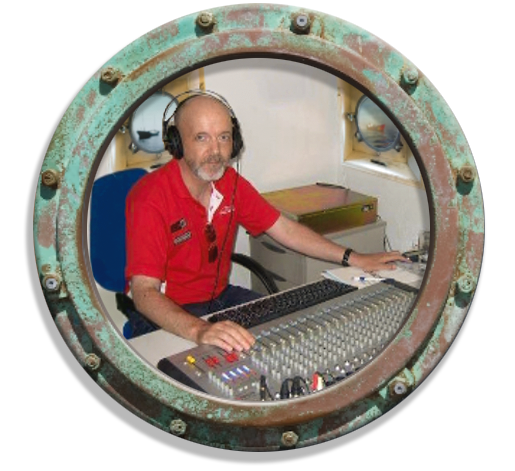 Bob Le-Roi is an offshore veteran too, a presenter who has been in broadcasting virtually his whole working life, starting out on Radio City, one of the legendary offshore radio forts off the coast of his native Whitstable. 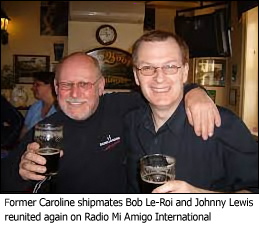 Since then, Bobs voice has been heard on a long list of radio stations: BBC Radio Medway, ILR Invicta Radio. Radio Fax in Ireland, Juke Box Memories, European Classic Rock. Radio Seagull and the Voice of Peace, just to name a few. Whilst still at the BBC, he became involved in supplying the Ross Revenge through 1983 - 1990, an illegal operation that was universally known as 'The Whitstable Navy'. He later joined Radio Caroline, working out of the Maidstone TV Studios and later in Larkfield. 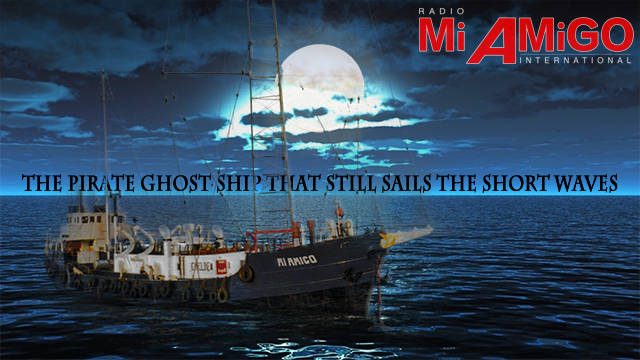 Radio Mi Amigo International - home of many former Offshore Radio pioneers - is proud to add Bob Le-Roi to its current crew of Free Radio presenters. As of this weekend, Bob can be heard weekly as part of Mi Amigo's live weekend programs. Check out the DJ pages of Bob Le-Roi and Hans Hogendoorn for more info. FORMER RNI'S 'HANS TEN HOOGE' TO JOIN MI AMIGO! It is with pride and great pleasure that we can now confirm that former RNI -onboard- Dutch DJ/Newsreader 'Hans ten Hooge' (real name: Hans Hogendoorn) will join Radio Mi Amigo International's crew. Hans is a fantastic addition to our team of former offshore radio presenters, and not just for his great work on the MEBO II. 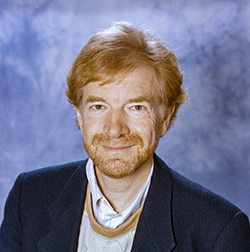 For many years he was also a very well-known shortwave presenter for 'Radio Netherlands World Service', for which he also created all imaging. Furthermore, Hans' unique and very recognizable voice is still widely known in the Netherlands, as for some 20+ years he was the station voice for NOS radio, the Dutch national public broadcasting organization ('the Dutch BBC'), where he can still be heard in imaging and promos. Apart from being a great broadcaster, Hans also is one of the nicest guys in the business, who loves radio and has fond memories of the offshore radio days, same as we all do here, at 'Europe's Best Oldies Station'. We expect his first shows to start in mid November, at which time we'll publish a special edition of our Newsletter with more information and details about Hans Hogendoorn joining Radio Mi Amigo International. Stay Tuned! 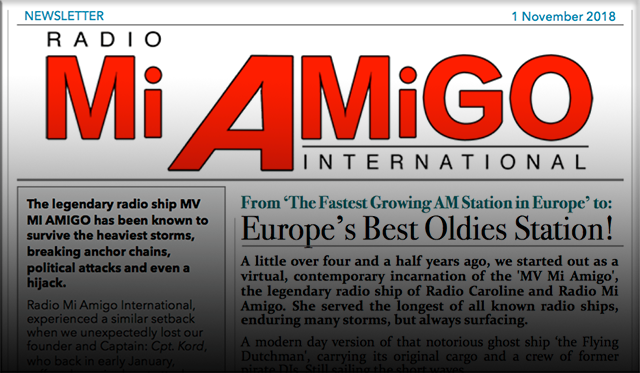 Radio Mi Amigo International's November Newsletter is here! The latest edition of our Newsletter is out today. In it you'll find the latest news about our station, the autumn competition, how YOU can help to keep us on the air and much more. You can download or subscribe to the newsletter(s) here. If you have subscribed in the past you will find it in you email today. Due to new legislation it is possible that some of you will have to re-subscribe and 'opt-in'. 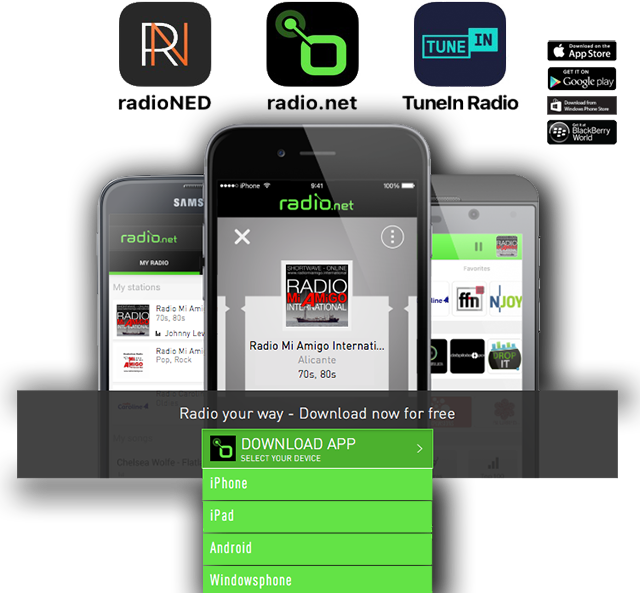 Take RADIO MI AMIGO with you - now on all smartphones! Did you know that Radio Mi Amigo International can be received while you're on the road, in the car or anywhere you are, via your smartphone. Any smartphone: iPhones, Androids, Windows Phones and Blackberries. Just click in this picture to find your favorite App store, also open this link in your smartphone and download the app from there. Once inside the app, look for Radio Mi Amigo International and mark/save it as a 'favourite'. You're always just one screenclick away from our music, wherever you are! After weeks of tough negotiations Radio Mi Amigo International and Emperor Rosko are happy to announce they renewed their mutual commitment for another year, securing the legendary DJ's weekly program until at least September 2019. 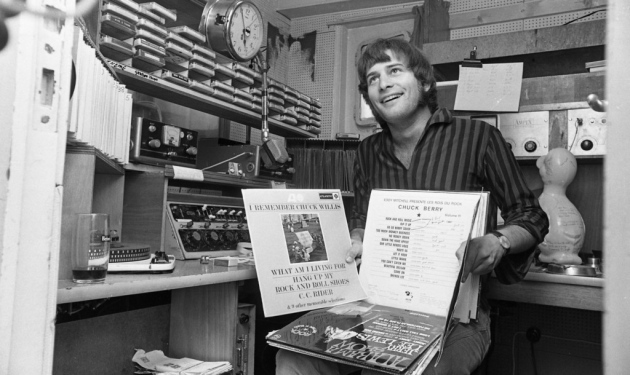 In the mid-60s, Rosko served on Radio Caroline's ship the MV Mi Amigo in the 60's joining Caroline South in early 66 and leaving around the autumn of that year to join the French service of Radio Luxembourg. Later he also worked at BBC's Radio 1. 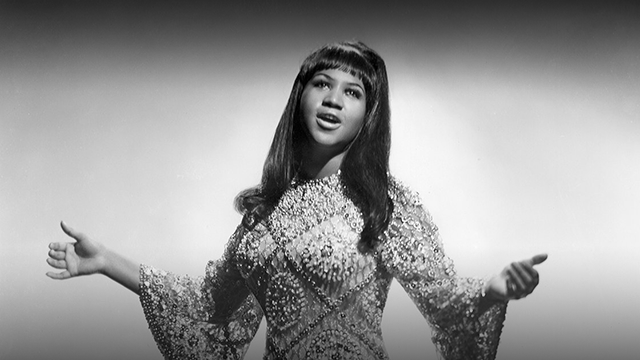 This weekend Bruno Hantson, our Soul Brother and R&B connaisseur extraordinaire, presents a one hour tribute to the Queen of Soul, Aretha Franklin, that is NOT to be missed! The show airs Saturday at 18:00 hrs and again on Sunday at 09:00 and 18:00 hrs. 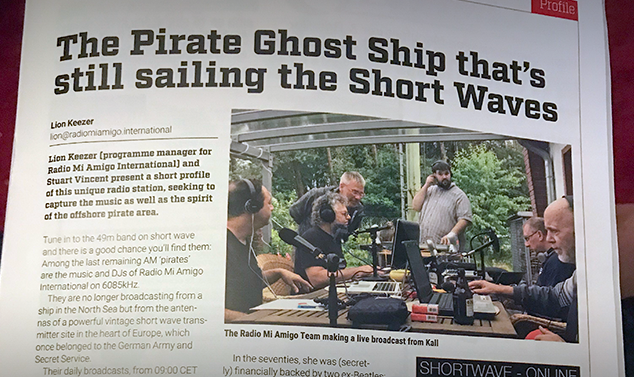 There's a nice article about Radio Mi Amigo International in Radio User magazine, the result of increasing popularity and listeners numbers we currently see in the UK. The August edition of Radio User magazine just came out and is currently available in shops everywhere in the UK. We have upgraded our web streams! Our low bandwidth audio stream for use in mobile devices has been upgraded to 96 kbps AAC+! This latest streaming technology now gives you THE SAME audio quality as our main 192 kbps MP3 channel but with HALF its bandwidth use. After experiencing issues with our audio streams last weekend, we replaced them, solving all problems while doubling the audio quality of our stream for mobile use! Still problems connecting? Refreshing the cache of your browser then reload should solve it. The players should then work again. This weekend sees the start of our new 2018 Summer Schedule: Friday - Sunday: live shows and great music. Technical update for our web stream listeners! 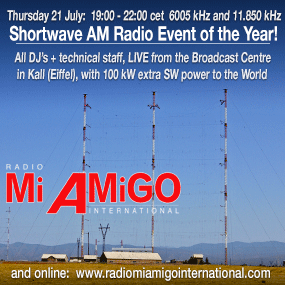 Radio Mi Amigo International not only broadcasts on Shortwave 6085 kHz, but our music can also be enjoyed in full HD stereo via one of our two webstreams (see listen links at the right menu). Some of you are listening via IP Radio's or other players and some of our earlier fans may have used one of 3 older webstreams that now will be discontinued as of Tuesday, April 24. You may be aware that our captain and leader Cpt. Kord is seriously ill in hospital. As we wait for the news that he is well enough to continue the great work he has started with the radio station, we have organised ourselves into an interim Management Team to keep his dream alive. 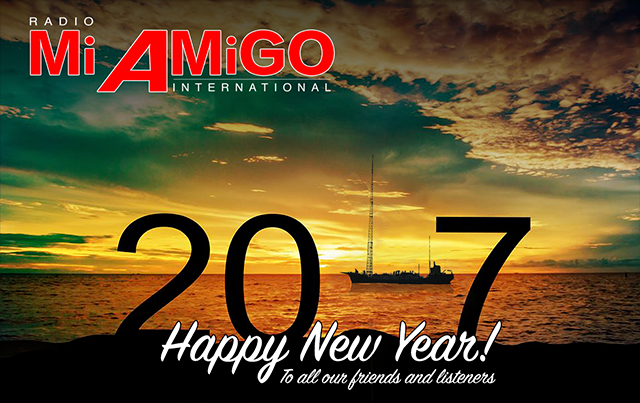 The team has been appointed with one aim: to keep Radio Mi Amigo International bringing back 'the golden era of AM offshore radio'. One of our first priorities was to sort out the problems accessing vital systems Kord used to manage from his studio in Spain, such as our website, webshop and email system. Whilst some parts of the operation were temporarily proving difficult to maintain to Kord's high standard, we'll get there. We temporarily closed the webshop as due to the Captain's absence there's also a backlog of orders. Email addresses linked to the original domain are not working yet, but that too will be fixed soon. We'll keep the first part (everything before the '@') of the addresses, only replacing the old domain name with the new 'radiomiamigo.international' domain name. So regularly check the new website or the new Facebook page for the latest news. 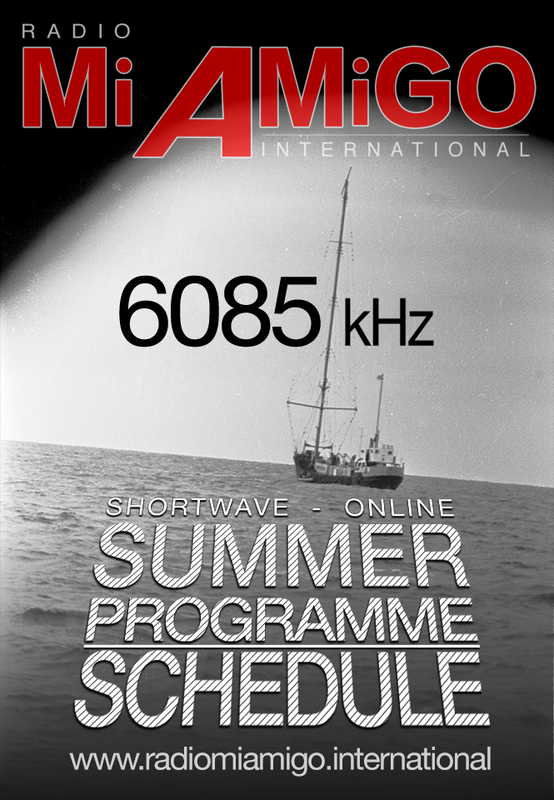 Our daily shortwave transmissions on 6085 kHz in the 49-meter band remain unaffected and continue as normal. If you’d like to listen digitally, best way is to use the links at the top right menu from our website. So, thank you for your understanding. And thank you for your support. Together, we will keep Captain Kord’s dream alive. 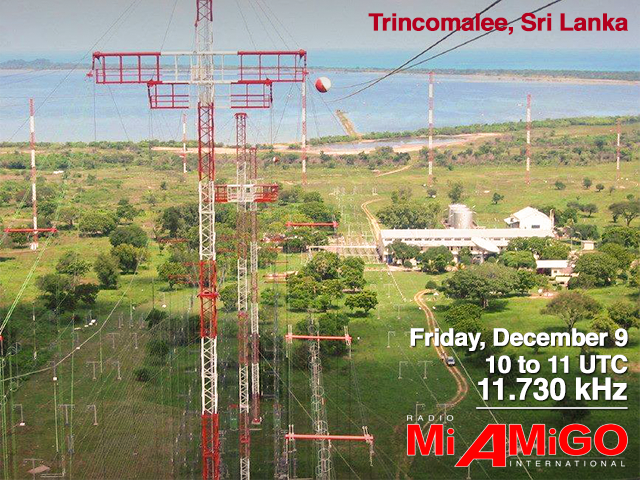 Together, we will keep Radio Mi Amigo International on the air! Words can't describe the sadness we feel losing one of our own: Peter van Dam - the original Radio Mi Amigo icon, DJ, our colleague, friend, the voice in almost all of our jingles and audio design. 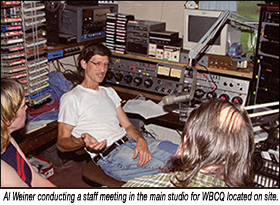 Peter spend the last years of his long and amazing radio career on the station where it all started: Radio Mi Amigo. His contemporary shows were original, sparkling and popular as ever, bringing joy and delight to his many fans, to us - and to himself. 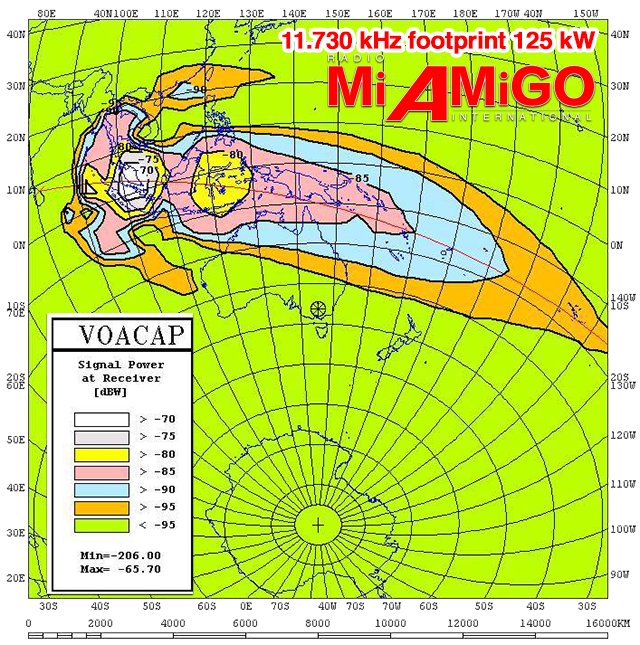 Mi Amigo's daily shortwave broadcasts bring back that warm original AM radio sound that comes with AM modulation. REAL radio, the way we remember it from those exciting times when the Pirates ruled the airwaves. Combined with our jingles and a selection of great songs from the 60's, 70's and 80's, it instantly brings back the memories of the Golden Era of offshore broadcasting. Always trying to find new ways of reaching new SW audiences both in- and outside Europe, this month we are conducting a series of test transmissions from within the USA. Last December we had a successful 125 kW broadcast from Germany aimed at North America. Reception reports came in from all over the USA but also from many South American countries such as Mexico and Brazil. 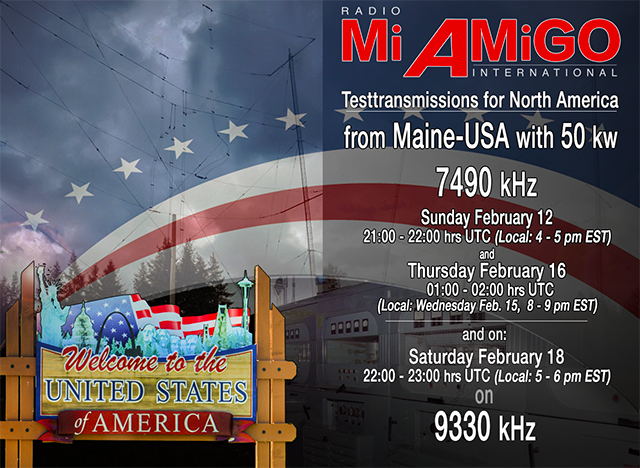 This month we will do 3 test broadcasts from inside North America, from the small town of Monticello in the northern US state of Maine, very close to the Canadian border. We'll use the two 50 kW transmitters from SW station WBCQ, which is run by a dedicated team of radio enthusiasts for the benefit of the listeners. 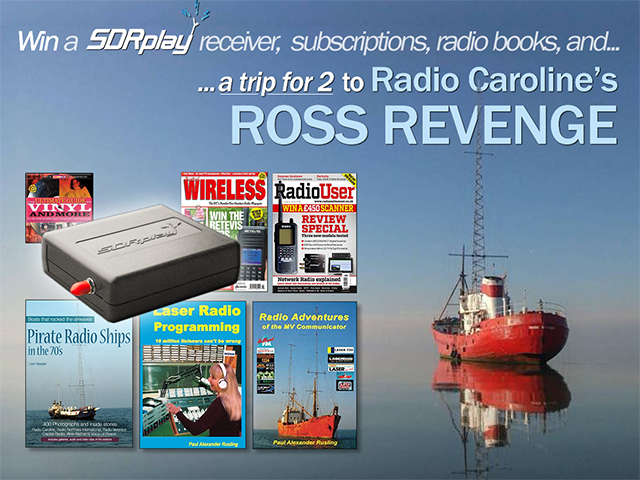 There's also a link with European Offshore radio since one of the leading figures behind WBCQ is Allan Weiner, who worked for Radio Caroline on the Ross Revenge in 1985 and later went on to start his own offshore station Radio New York International (RNYI) from the M.V. Sarah in 1987. We would like to thank our listeners for all the nice reactions to our programs! We received so much mail over the past weeks: real letters, emails and photographs of where you put our stickers. So thanks again you are the best! Keep listening and we'll keep providing the music, every day on 6085 kHz and online! 'The Fastest growing AM Radio Station in Europe' would like to thank all listeners for their support over the past year. In the new year we will continue to grow and keep you entertained and surprised, so stay tuned in 2017! Now: every day on 6085 kHz: our new -all day- frequency! Great news: as of Sunday, October 30, we have our own dedicated Shortwave frequency of 6085 kHz and extended our daily broadcasts from 9 in the morning until 6 o'clock in the evening. 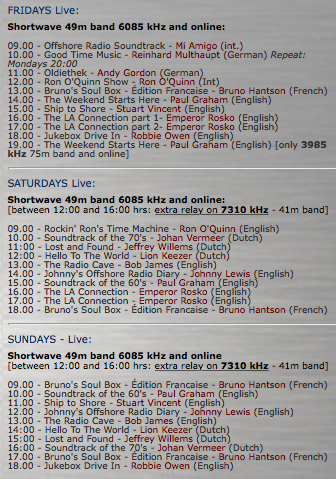 on Saturdays and Sundays our international DJ’s will present shows live - all day..! Our daily live programme 'Hello Europe' can be heard on weekdays 14:00 hrs and will be repeated later at 19:00 hrs in the 75 m band on 3985 kHz. 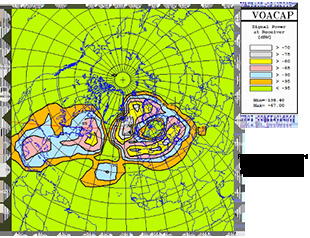 The new dedicated shortwave transmitter on 6085 kHz is a big step forward, but our growth will not stop there. We expect to bring you more exciting news about further AM expansion in the Northern European regions soon. What started two and a half years ago with a few tests on shortwave (initiated in Spain by our 'Captain' Kord Lemkau), has grown fast into a consistent pan-European radio station with an international cast of mostly former Offshore Radio DJ's and studio's in 5 countries. Now, with a more modern, contemporary touch and today’s technology, we are still fully dedicated to preserve the idea of Free Radio and do so with programmes and music that reflect the Golden Era of Offshore AM Free Radio. Broadcasting on Shortwave, Medium Wave, FM and online, we enjoy a steady growth, with faithful listeners - not only in Europe but literally from all over the globe such as: the USA, South America, Scandinavia, Eastern Europe and Australia. Special celebration broadcast this Saturday: COME CELEBRATE WITH US! 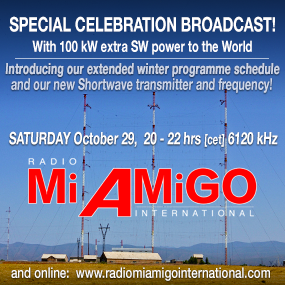 Saturday, October 29: Special 100 kW broadcast on 6120 kHz! Coming Saturday night, October 29, from 20:00 - 22:00 hrs [CET], we present a special powerful shortwave broadcast originating from our 100 kilowatt (!) relay station in Armenia, on 6120 kHz. 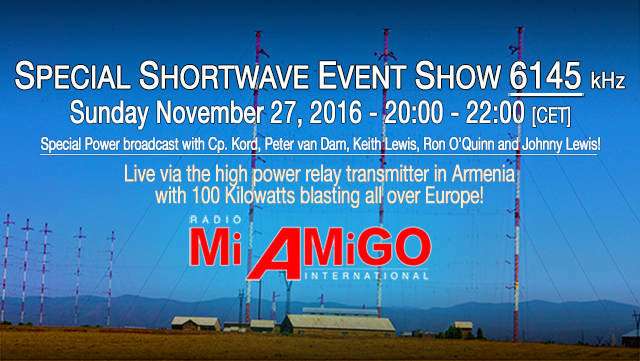 In this special live event show we will introduce and celebrate our own shortwave transmitter and frequency as well as our new -extended- winter programme schedule. Hosted by Lion Keezer in Amsterdam, he and 5 other Mi Amigo DJ's will contribute live from their studio's in the UK, Belgium, Holland and Spain to tell you all about their shows and our new schedule and frequencies that will officially start the next morning, Sunday, 30 October, 09:00 hrs [cet]. We expect this broadcast to be received not only in Europe but also in large parts of the world and we look forward to your reception reports. 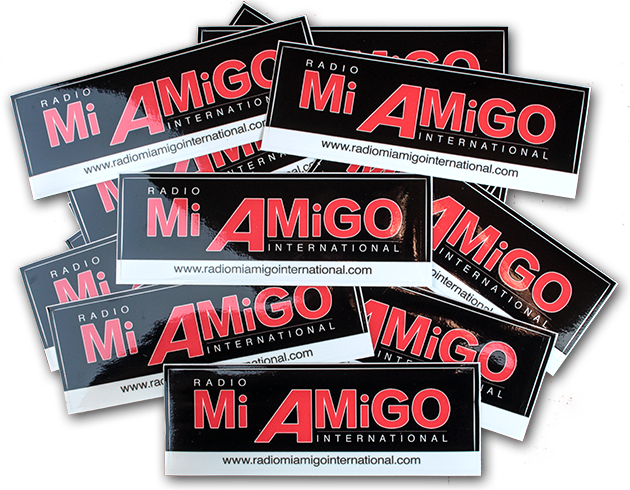 As always, we'll reward you with our new printed QSL card and Mi Amigo car stickers. 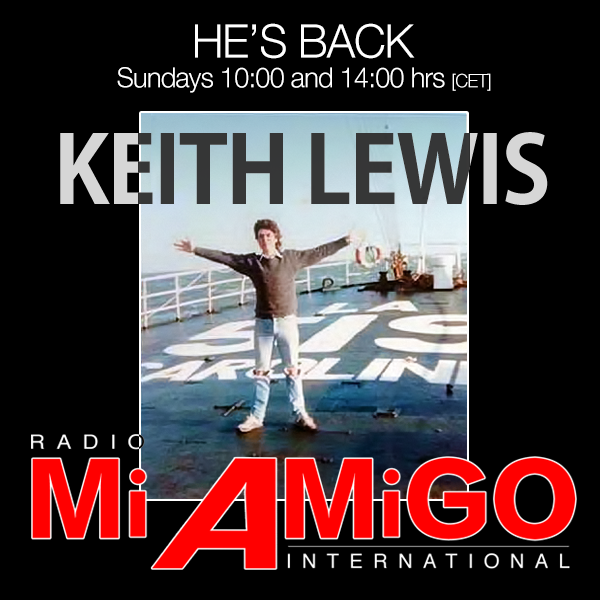 We are delighted to announce that another former offshore radio DJ will join the Mi Amigo International team: Keith Lewis. The Voice of Peace, Radio Caroline, Radio Nova - are just a few of the stations that Keith Lewis worked for, back in the 80's. 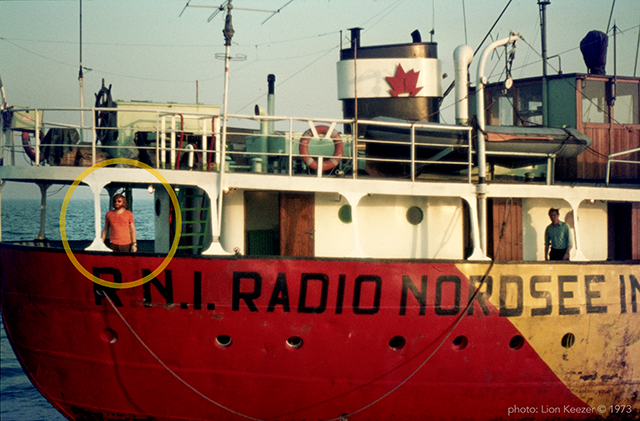 Keith is a true believer in Free Radio, and like all of us he got inspired again by the idea of 'Bringing back the Golden Era of Offshore AM -Free- Radio' on todays airwaves. After 22 years of absence he decided to make his comeback at Mi Amigo, the fastest growing AM -Free- Radio station in Europe. Welcome on board Keith! 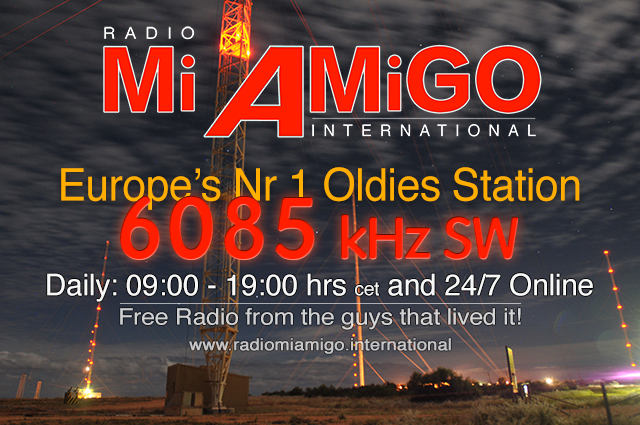 New Radio Mi Amigo QSL Cards! For those of you who received us on Shortwave or AM -and have send us reception reports, we have brand new QSL Cards! Here they are: our new bumper stickers - fresh from the printers, available as of today! We'll send you some for free if you send us a reception report in the month of September - and it would be nice te receive back a picture of one of our stickers somewhere in Europe or some other exotic place where we are received! Write us! Having trouble listening to our High Quality 192 kbps online stereo web stream via your smartphone or because of slow internet connections? We heard you! As of September 1st we installed an extra -low bandwidth- (48 kbps!) AAC+ web stream that will still give you amazing audio quality on all your mobile devices and on computers with limited bandwidth connections, especially in remote areas where high speed connections are not available. So check it out, there are new links to the 48 kbps AAC+ stream from the right menu on all our web pages on this site. Enjoy! PS: We also upgraded our 192 kbps player to look better and perform faster! Our good friend and collegue Paul Newman is leaving Radio Mi Amigo International. His workload increased dramatically (his job requires a lot of travel during the week) and so did his many radio commitments. Paul has been with us for well over a year and we are going to miss his warm familiar voice and the chimes of London's Big Ben every Sunday. So thanks Paul for all your great shows and friendship during those years. All the best from all of us here at Mi Amigo and lots of luck in your new Radio Adventures! Welcome home Peter van Dam! New International Saturday program schedule!